Our faith is one filled with order, rhythm, and structure. Introducing kids to the meaning and richness behind that order, especially of the Mass, can help them understand and enter into worship with all the faithful. I've used a couple of sets of cards about the order of the Mass for years in my classroom for this purpose, but decided to upgrade my handwritten-on-index-cards to these nice printables that I can share with you. We typically use these as station activities during our Eucharist unit, but they also lend themselves to jigsaw activities, or you can print a whole class set and work through them together. Below, I've given you a few tips and ideas for using the cards with kids, but the possibilities are endless! I'm sure you can come up with many more uses that will fit the needs of your students! I also love to share the Scriptural origin of the Mass with my students and reveal how much of the Bible they know just from the responses and prayers at Mass. 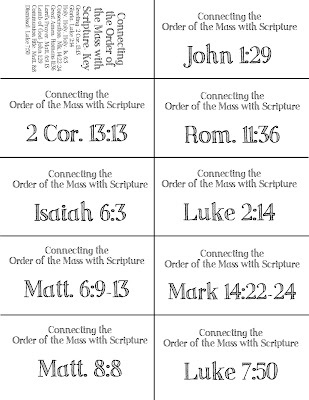 This set of cards gives nine Bible references to look up that connect to a part of the Mass. The students can look up the verses and see if they can identify the origin of the Holy, Holy, Holy, or the prayer of Consecration, etc. Katie, I just realize I tell everyone but you how much I LOVE and rely on your blog, as a mom and now as the Director of a Children's Religious Education program. You are SUCH a blessing. Thank you! You are very creative! You inspire me! Thank you for sharing so many of your talents!